In a new study, scientists have searched for mutations in the gene regions of more than 100 kidney cancer samples, the largest number of samples from a single tumour type to be sequenced to date. Clear cell renal cell carcinoma (ccRCC) is the most common type of kidney cancer, with 102,000 deaths worldwide each year. It is noteworthy because its pathology – all the visible clues to its nature – is remarkably consistent and the majority of cases are known to be driven, at least in part, by mutations in a single gene, VHL. In this study, the team looked for mutations in 3544 genes in 101 cases of ccRCC to begin to investigate the complexity within this reasonably homogeneous cancer type. “ccRCC has such a strong genetic signature, with the VHL gene undergoing mutation in more than 50 per cent of samples,” explains Dr Andy Futreal, co-leader of the Cancer Genome Project at the Wellcome Trust Sanger Institute. “It also has a strong pathological signature, with a homogeneous appearance in most cases. As well as finding mutations in more than half of the cases examined in the VHL gene previously known to be important in ccRCC, the researchers found evidence for additional mutations in other genes. In particular, they showed that two genes implicated in modulating structural control of gene expression on a genome-wide level had acquired inactivating mutations in ccRCC. These genes, JARID1C and SETD2, encode proteins that move modifying signatures on and off proteins known as histones, which are critical in packaging the DNA thus controlling gene activity. These mutations further elaborate on a theme in ccRCC – this team of researchers had previously identified mutations in UTX, another gene controlling histone activity. Strikingly, even though ccRCC is a particularly homogeneous cancer type both pathologically and genetically, none of the additional mutations identified accounted for more than five per cent of cases. These results exemplify the genetic complexity of human cancer and provide the further impetus for the design of studies to more fully delineate complete catalogues of the genes implicated in human cancer. The researchers also identified somatic mutations in the gene NF2 in the particular subset of ccRCC which appear to not be driven by VHL mutation. NF2 was previously known to be involved in hereditary cancers affecting primarily the nervous system. Following the initial survey of 101 samples, the researchers examined those genes found to be mutated in a further 300 samples to further clarify the potential importance of mutations in ccRCC. Delineation of the genetic foundation of ccRCC will ultimately help in diagnosis and in selection of treatment: the data show that, on the basis of genetic lesions, even apparently homogeneous cancers can be begin to be classified into subtypes that display distinctive biological features driven by specific mutations. There has been some success in exploiting one driver mutation in ccRCC, VHL, in therapeutic approaches – the most productive means to discover new biological understanding of this enigmatic cancer has been genetics – and more will be needed. “Even in a tumour type dominated by single histology, with a prevalent signature, even in this ‘clearest’ of cases, we see evidence for substantial genetic heterogeneity,” explains Dr Futreal. “In this large set of 100 ccRCC samples, some mutations are found only once or twice and so we are likely to have missed others. 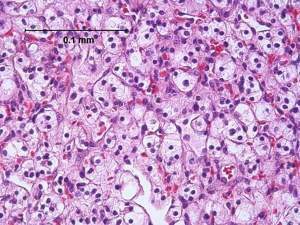 Renal cell carcinoma accounts for about 209,000 new cases per year worldwide and 102,000 deaths. Compared to other adult carcinomas, the genetics of ccRCC are distinctive, with the majority of ccRCC cases displaying either somatic or germline inactivating mutations in the VHL gene, which are absent from most other cancers. The three genes that modify histones are SETD2, JARID1C (KDM5C), as well as UTX (identified in a previous study). This work was supported by the Wellcome Trust and the Hauenstein and Gerber Foundations.